Situated in the gardens around Melbourne's Immigration Museum, on the North bank of the Yarra River. This project proposes a series of temporary rooms and windows, made from cutting and perforating two shipping containers. 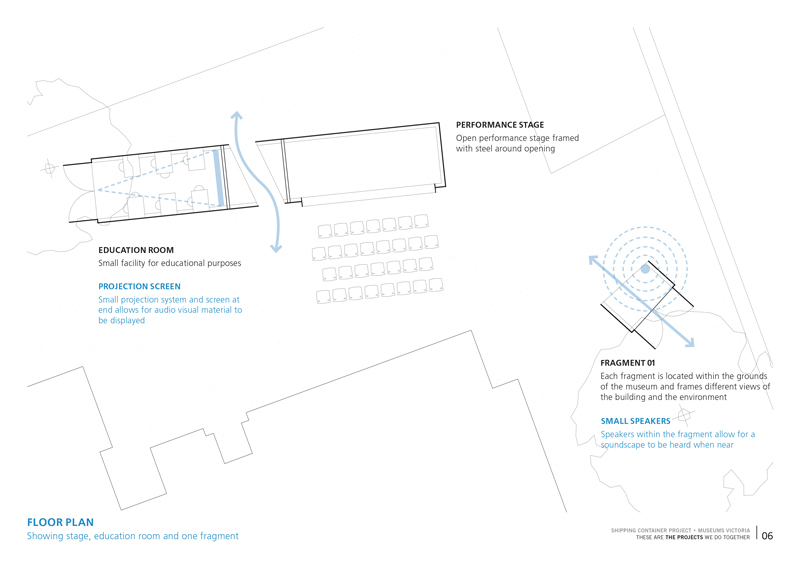 The shipping containers provide small spaces within the existing outdoor setting for performances, soundscapes and enable an extension of the interior exhibition spaces. The sliced sections of containers also become little rooms and windows, providing shelter and also frame through which the existing heritage building can be viewed differently. The exterior shells of the containers are painted to match the original heritage-listed building and perforated with thousands of porthole-inspired small apertures.